This is an excerpt from Ukraine in Conflict: An Analytical Chronicle. An E-IR Open Access Book by David R. Marples. In 2014, I was appointed Chair of the Department of History and Classics at the University of Alberta, signifying that I could no longer continue to assist at CIUS. Along with teaching duties, my time was more limited. In the summer of that year, however, before taking over as Chair, I was a Visiting Professor at the Centre for Russian and East European Studies at the University of Hokkaido, in Sapporo, Japan. Suddenly I had the time to study more closely (though not literally) the events in Ukraine and the personalities involved. Above all I had time to write. From June to August 2014, and slightly beyond, I was able to produce more in-depth articles (10-17 in this book) at leisure in an ideal working environment, and once I returned to Canada, I continued to write even under the pressure of a difficult administrative post, often completing items I had begun in Sapporo. The topic really has no end, but it seems to me that the onset of decommunisation in Ukraine, involving the removal of Lenins and ban placed on the Communist Party and Communist symbols and monuments, is a conclusion of sorts. The war in the east continues in spasms, with no substantial gains by the Ukrainian government or the separatist regimes, but in the remainder of Ukraine the transformation is readily apparent to any visitor. Ukraine is casting off its Soviet heritage, at least the physical manifestations of the Leninist past and creating something new, largely based on what is termed the struggle for independence in the 20th century. For me, this marks an end of sorts to the phenomenon known as Euromaidan. There were two options at this juncture: either to restructure the articles or to leave them in their current form. I selected the latter for a variety of reasons. They seem more authentic and natural this way. Although there is inevitably some overlap between them, they provide a narrative from the beginning to a logical end point. At times, the conjectures therein were obviously incorrect, but those reflect prevailing opinions or my own thoughts at the time of writing. As analyses rather than news stories, there are also some discussions with or about the interpretations of other scholars. Perhaps here I should make my own position clear. As Euromaidan developed I tried to maintain a distance from events, which was possible for a scholar of Ukraine who is not of Ukrainian ancestry. Many of my colleagues wholeheartedly supported the protests and condemned Russian actions. Others adopted a concerned and sometimes scathing attitude to what they perceived as the rise of extreme ethnic nationalism in some parts of Ukraine. By the spring of 2015, when Ukraine introduced its so-called Memory Laws, together with James Sherr of Chatham House, I sent a letter to Ukrainian president Petro Poroshenko, which advised against accepting them. We argued that they would place prospective shackles on scholars, especially in Ukraine, who might question the reputations of the ‘fighters for independence in 20th century Ukraine’, who include some controversial figures, especially from the period of the Second World War. One of the initiators of the laws declared that we were all (over 70 Western scholars from North America, Europe and Ukraine) agents of the Kremlin. It was a sign of the polarisation of society. No criticism was palatable, even from those who thought they were friends of Ukraine. Both the Russian and Ukrainian governments indulged in propaganda. In Russia, the propaganda was part of the hybrid conflict and was quite effective. It took some time for the Western world to comprehend and respond. In Ukraine, those who had always distrusted Vladimir Putin were strengthened in their beliefs, while many who had not expected an invasion were heavily shaken. I visited Ukraine in both 2015 and 2016 and was able to talk to some of the participants of the events. I have corresponded with many others, including people who fought on both sides of the border in Donbas. I have attended local, national, and many international conferences on the problems engendered by Euromaidan, and gained the impression that an analytical chronicle of events as they appeared at the time would not only be useful, but might also help readers acquire a clearer perspective. That is what I have tried to do in this collection. It begins just prior to the aborted signing of an EU-Ukraine Association Agreement, during a summit in Vilnius, Lithuania in November 2013. It ends with a discussion of decommunisation and the programmes and policies of the Ukrainian Institute of National Remembrance, tasked with introducing and monitoring the changes of city and street names and removals of statues and memorials dedicated to Soviet figures. The last entry is actually by way of a conclusion. Throughout, it should be clear that Ukraine has been placed in a position of crisis, partly by Russia and partly by its own leadership – starting with President Viktor Yanukovych, but also by its own business elites that remain in place today and wield strong influence. The book is aimed at an academic audience in part but framed so that it is accessible to the wider section of the population that became fascinated and horrified by what occurred. At the time of writing, the death toll in the war that followed Euromaidan is over 10,000 – with tens of thousands wounded and several million displaced from their homes. And, these events followed 22 peaceful years following the declaration of independence in 1991. What has occurred might be perceived as the long-term consequences of that independence and the efforts of some Ukrainian leaders to distance Ukraine from its Russian neighbour. No doubt, some scholars would assert that the West is more responsible than Russia, by trying to attract Ukraine into its structures – particularly the EU and NATO. At the annual convention of the Association for Slavic, East European and Eurasian Studies in Washington, DC (November 2016), both former US Ambassador to the USSR, Jack Matlock and Professor Emeritus of Princeton University Stephen F. Cohen expressed this view to what appeared to be a large and sympathetic audience. My goal herein has not been to answer these questions but to provide a depiction of a society in a state of upheaval and change, and in which major players like Russia and the EU have played important roles. Above all, it is about change and upheaval in Ukraine – one of the largest countries in Europe – which after more than two decades has run into difficulties and faces opponents that even question its right to exist. The articles cover a period of over three years, arguably the most traumatic in the history of independent Ukraine. They begin with the prelude to the signing (or non-signing) of the Association Agreement between Ukraine and the Soviet Union. Yanukovuch’s sudden change of mind was the spark for the first protests in the square, now familiarly and better known as ‘the Maidan’. The name given to the demonstrations, Euromaidan, was based on these initial protests. The articles in the volume are mainly concerned with Ukrainian politics, with some emphasis on economic, social and historical questions. Some are academic, and others are commentaries, but usually founded on a wide reading of the Ukrainian media and government outlets. The goal in every case is to make the content comprehensible to the general reader as well as the specialist. The articles are ‘frozen in time’ in that they have not been revised, but in almost every respect they remain relevant today. The overall goal is to elucidate a complex and divisive period, which is still evolving a quarter century after the collapse of the Soviet Union. In many respects questions shelved in 1991, thanks partly to the peaceful demise of the Communist state, are re-emerging – and for Russia, no question is more crucial than the future of Ukraine. Euromaidan elicited a dramatic and ruthless response from Russia, namely the annexation of Crimea, which narrowly preceded the departure of Viktor Yanukovych and the imposition of a temporary government of Ukraine that excluded representatives of the former Regions Party, of which the ex-president had been the leader. Most of the articles focus on these events and what followed in the eastern regions, where the disillusionment with the Euromaidan took on extreme forms. In the spring of 2017 it is possible to reflect on these events. Some clashes are still taking place in the Donetsk and Luhansk regions, but the intensity has not reached the level of 2014 or early 2015. Several related questions appear constantly in academic discussions and social media: Firstly, was the removal of President Viktor Yanukovych a coup d’etat and did extremist forces hijack the protests to further the installation of what Russia has termed a Nazi regime in Kyiv? Secondly, was the eventual outbreak of war in the east a civil war or simply a Russian invasion of Ukraine, following on from the takeover of Crimea? On the first question, I think there is enough evidence that although the far right forces played an important role in the later stages of Euromaidan, they were unable to dictate their will. They carried out acts of violence, but the temporary government installed after the president left office was not in any way Nazi, neo-Nazi, or even particularly right wing. Moreover, Yanukovych opted to leave Kyiv. He was not physically attacked or threatened even during the final stages of the uprising. The temporary government established by the demonstrators was soon replaced by a newly elected president, and shortly by a new parliament. While certain parties, most notably the Regions Party, were dismantled, the extremist forces did not benefit much from these events. That explains in part why they remain so disaffected today. Incidentally, Yanukovych continues to deny that he gave an order for the Berkut police forces to fire on demonstrators. Thus, we are still left with the question – addressed further in this collection – of who were the snipers who fired on protesters killing the ‘Heavenly Hundred’ who are commemorated in Ukraine today? The government inquiry has been inconclusive and unsurprisingly the question has elicited much speculation. Though Yanukovych was in many respects a tyrant, he was a weak leader who seemed afraid to order a complete crackdown on the protestors. He was unlikely, in other words, to have authorised extreme force. But, an order to use lethal force may have come from another government agency. Concerning the second question, the simple answer is that Ukraine experienced a civil war, but the separatist forces were relatively weak until bolstered by Russian military materiel and ‘volunteers’ – including many of the initial leaders of the regimes in Donetsk and Luhansk. But, it would be facile and incorrect to state that these two ‘people’s republics’ were creations of Russia. They expressed a deep discontentment within the region with Euromaidan and the new government in Kyiv. Within a matter of weeks, the Donetsk region, which had boasted the president, prime minister and most of the Cabinet of Ukraine, had lost all its power. And, many felt detached from the events in the centre and west of the country. Thus, long nurtured desires for more autonomy came to the fore. One can term these sentiments pro-Russian, pro-Soviet or pro-separatist. More accurately they were a reflection of the mind-set of many residents. Several further points can be made three years on. Firstly, Ukraine has moved away from the Russian orbit. This statement applies easily to the western regions and to central Ukraine around the capital Kyiv. But more important, it is clear that industrial regions that were formerly in the Soviet Communist heartland, like Dnipropetrovsk (the city is now called Dnipro) and Kharkiv have no desire to separate from Ukraine. Even in the distant east, in the coal mining and steel towns of the Ukrainian part of Donbas, opinion polls indicate that there is no longing for a Russian invasion or to join the Russian Federation. Rather, the population would prefer more autonomy and local power. 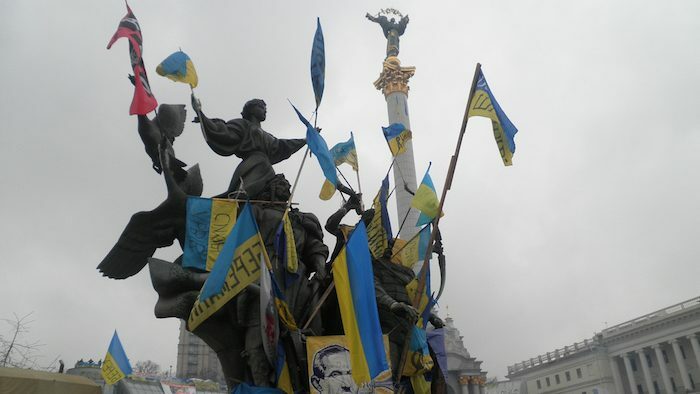 In this sense, the new Ukraine is here to stay, even if it is not yet clearly defined. I believe the articles herein help to explain why. After 25 years, there is a general satisfaction within the country with the concept of an independent Ukraine. Secondly, the quasi-messianic phase of the conflict, the quest for the so-called Russkiy Mir (Russian World), initiated in Moscow has failed. Indeed, it is rarely mentioned by the Russian leadership and is confined to eccentric academics like Aleksandr Dugin and some of the wilder separatist leaders – most of whom have now left Donetsk and Luhansk, or been killed in action. This fact should not surprise us. The idea of a Greater Russia – Rossiya – did not take root in any of the prior places in which it was attempted. This can be seen in the examples of Abkhazia, South Ossetia (the breakaway parts of Georgia) and above all Transnistria, which separated from Moldova thanks to Russian intervention in 1992. In the place of a New Russia, there is disorder and a lack of security. The host countries are suffering a form of internal cancer that they cannot eradicate because they do not have the force to do so. The government and separatists coexist unhappily and with occasional outbreaks of violence. From the Russian perspective, the consolation is that the lack of unification precludes these states from entering Western structures such as NATO or the EU. Thirdly, Ukraine’s response to Euromaidan has been ambivalent and at times questionable. Had I written this book in 2011 or 2012, the focus would without doubt have been corruption in the Yanukovych presidency, though it was also present in the administrations of the previous two presidents, Leonid Kuchma and Viktor Yushchenko. Corruption was one factor behind the Euromaidan protests. Yet it remains as much of a problem today as it was in 2010-13. Indeed Ukraine’s current president, Petro Poroshenko, has become even richer since he entered office – partly through his chocolate company, Roshen. But, Poroshenko is far from the worst of these Ukrainian oligarchs who control valuable resources and, in some respects, dictate state policy. There have been no radical reforms to take Ukraine in a different direction. That is not to say there have not been any reforms, but they have yet to make an impact on corruption. Instead, as I show in this book, the focus has been on erasing the past, most notably the physical manifestations of the Soviet period: Lenin statues, city and street names linked to Communism, monuments to Soviet heroes and architecture that appeared during the Soviet period. The campaign has not been without its critics, mainly for the way in which it is being conducted – ‘Communist style’ according to one observer. Volodymyr Viatrovych, who is leading the process, received a death threat in early March in the form of a wreath with the prospective date of his future death (9 May 2017) on the doorstep of the Ukrainian National Institute of Memory. For this author, the biggest concern is the nature of the programme to move Ukraine away from the Communist period. It is healthy to remove the Lenins that have adorned Ukraine for the past 90 years or so. But, the quest to replace Soviet heroes with new versions based on a nationalist interpretation of the past seems unwise. In some parts of Ukraine it could be seen as provocative and the key question is one of direction. Of what is the new Ukraine composed? How should one remember the past? Must it always be one set of heroes or another reflecting fundamentally opposed ideologies, or would it be wiser to facilitate national healing by focusing more on forgiving and acknowledging past indiscretions or crimes? Such questions spark heated debates within and outside Ukraine today. Alongside these debates has been a propaganda campaign in Russia against what it maintains is a neo-Nazi takeover of Ukraine. The vitriol extends to anyone who appears sympathetic to the cause of Ukraine. Russian propaganda has even targeted Canadian Foreign Minister Chrystia Freeland because her maternal grandfather edited a newspaper in Krakow when it was under Nazi occupation. Freeland had earlier been banned from travelling to Russia because of her strong support of Ukraine during the conflict and support for sanctions, imposed by the EU and United States in response to the taking of Crimea. Thus, Russian focus on Ukrainian nationalism has become an integral part of its foreign policy. In turn, some Ukrainians refuse to accept any Western critiques of their country. They accuse such critics of being ‘Kremlin agents’ who are working for Vladimir Putin and the Russian government. The accusation is usually inaccurate and induced by fear and suspicion. One should always recall that a very real danger of their country disintegrating and falling a victim to violence of outside forces influences public opinion. We in the West are not in this position and it is very difficult to comprehend the sort of decisions facing leaders in Ukraine. Still, many Ukrainian scholars have also taken the view that for Ukraine to pursue a democratic path, an official revanchist nationalist policy is hardly the best option. At present, these scholars are rather isolated. My goal in this book has been to take a more distant approach, though I have at times offered some examples of what I perceive as hyperbole or innate bias from Western commentators on Ukraine. The events have spurned a number of ‘instant critics’ – scholars who had not hitherto focused on Ukraine but have been willing to comment on social media or television about a country they have perhaps never visited. Invariably, they have taken the Russian side, arguing that Vladimir Putin is simply responding to Western – particularly American – intrusions into the former Soviet space. Most scholars of Ukrainian background in the West have been, conversely, fiercely supportive of Ukraine. One offered on YouTube a list of those scholars he had ‘uncovered’ as Russophiles. None appeared immediately to fit that description. As a historian by training, I recognise that the events analysed in this volume will likely not be understood fully for several decades. Nevertheless, the temptation to comment – and to comment frequently – was too hard to resist.